All Middle School students at St. Andrew’s College participate in our Reach-Ahead Mathematics program. This means that they are learning the curriculum one year ahead of their grade level, which ensures that the experience is challenging and enriching for all. 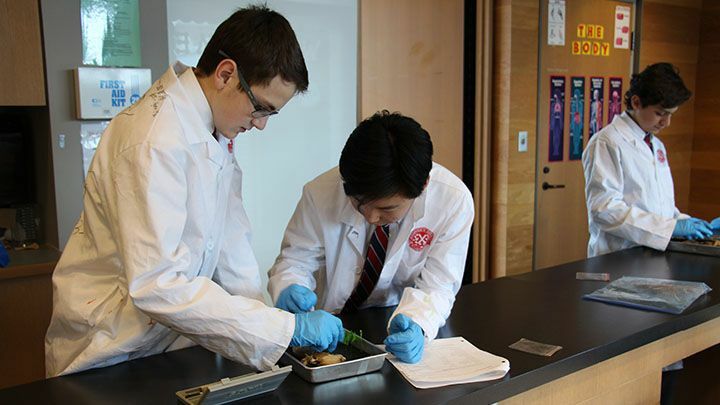 The courses are designed, however, to accommodate the fact that in each Middle School grade, there are students who are accelerating for the first time. To ease their transition, challenging math concepts are introduced gradually by first strengthening foundational skills. 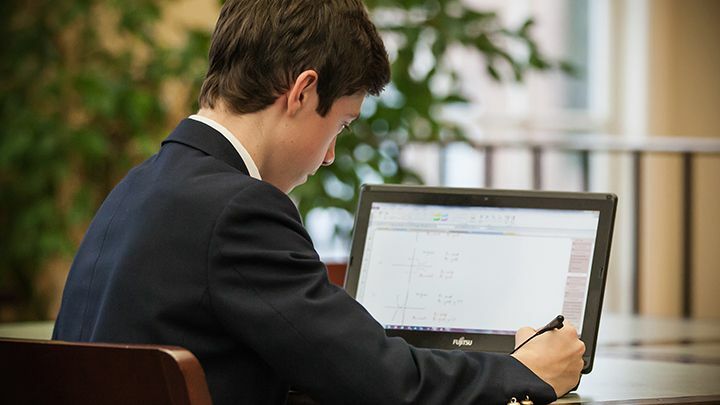 In order to ensure that individual students are not accelerated so quickly that they find themselves overburdened when they move to the Upper School, grade 8 students are streamed for math. Those students who are succeeding in our Reach-Ahead program take the grade 9 course in their grade 8 year, and those who need more time and practice to consolidate their skills work at grade level. The grade 8 students who continue with the Reach-Ahead program and perform well on the final exam will earn a high school credit for MPM1D and be recommended for grade 10 math in their grade 9 year. After tracking our students for a number of years, we have found that over 70% of those who successfully complete the grade 8 Reach-Ahead course continue to fast-track through grades 9 and 10. Once they reach grade 11, the extra math credit allows them greater flexibility in scheduling their final two years, which may include Advanced Placement (AP) courses. Success in any challenging mathematics program requires a proactive approach by the student. When a new concept is introduced, getting to the point when they say “I get it” is always a moment to celebrate. However, in a skill-based subject like mathematics, it is only half the battle; the student must also practice the concept by completing all the assigned work. This evolution of concept to skill allows them to perform well on an evaluation by tackling new questions without making careless errors. Collectively, our students enter the Reach-Ahead program with a wide range of mathematical abilities and, more importantly, a wide range of learning skills. The simple recipe for success for all of these students is to take ownership of their learning by listening and participating in class discussions and then using class time effectively by completing as much of the assigned work as possible while assistance from the teacher is available. At times, practicing and mastering new concepts and skills becomes a challenge within the time constraints of a 70-minute class. In this case, it is important for the students to use other resources available, such as extra help. For Middle School students, there are two options available. The first is Open Classroom, which takes place during lunch recess every day with the exception of Wednesday. This resource provides direct access to the teacher in a short 15-minute session and is useful for addressing one or two specific questions. A second resource, The Math Centre, is available for two hours after school, every day with the exception of Thursday. This resource provides students with individual attention by our mathematics co-op student. In the rare case that a student is taking full advantage of these resources and is still struggling with the course content, then options for more direct support will be discussed.